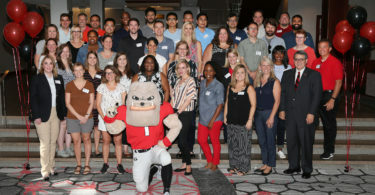 President Jere W. Morehead and the participants in this year’s New Faculty Tour pose in the University of Georgia Center for Continuing Education & Hotel before departing on their trip. 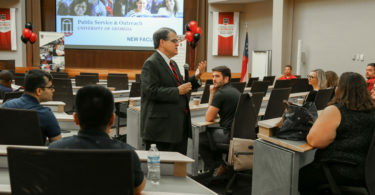 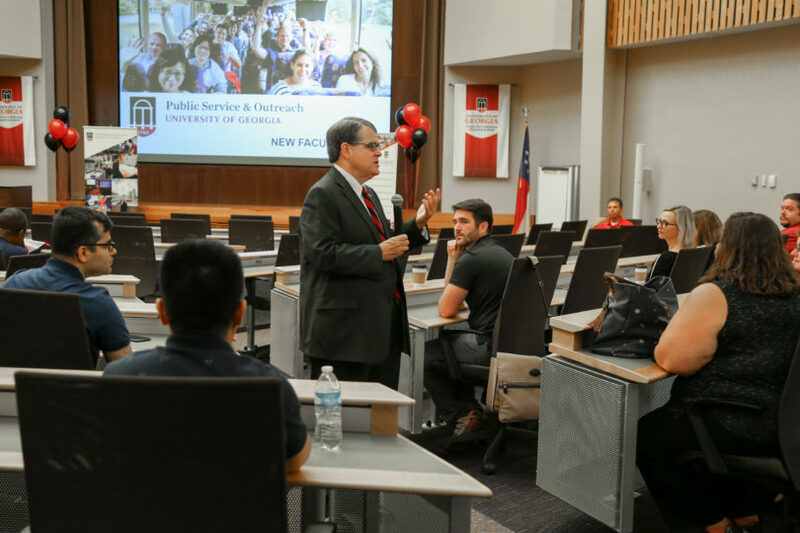 President Jere W. Morehead addresses the participants in this year’s New Faculty Tour in the University of Georgia Center for Continuing Education & Hotel prior to their departure. 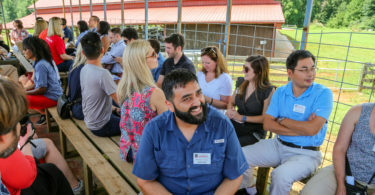 Mike Giles, president of the Georgia Poultry Federation, talks to the NFT participants at Jaemor Farms, where they learned about the vital role agriculture plays in Georgia. 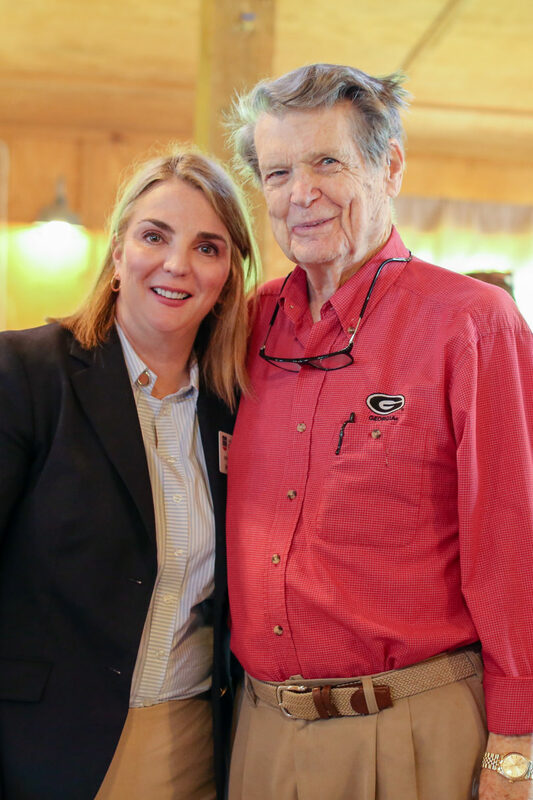 Jennifer Frum, vice president for public service and outreach, poses with Abit Massey, past president of the Georgia Poultry Federation and former president of the UGA Alumni Association, who spoke to the group at Jaemor Farms. 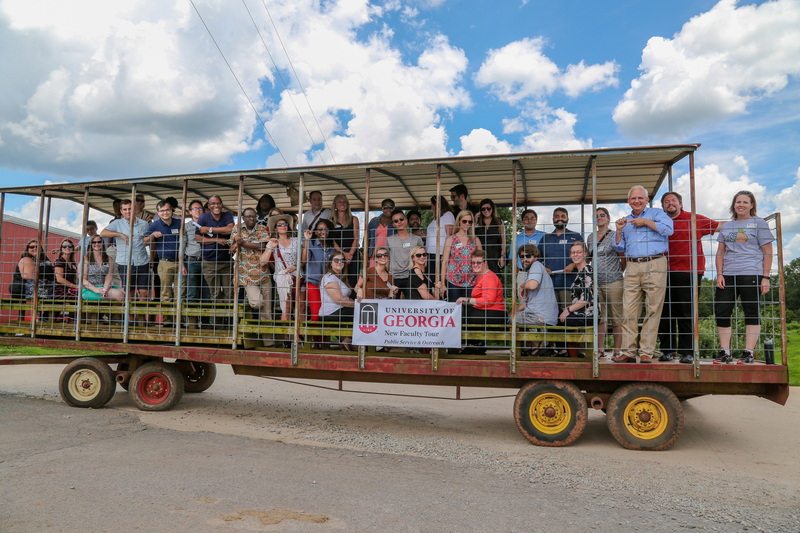 The NFT participants got a trip around Jaemor Farms to learn about the role agriculture plays in Georgia. 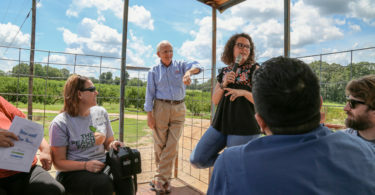 Gary Black, Georgia agriculture commissioner, and his daughter, Caroline Black Lewallen, a UGA alumna and communications director at Jaemor Farms, talk to the NFT group about the economic impact of agriculture in the state. 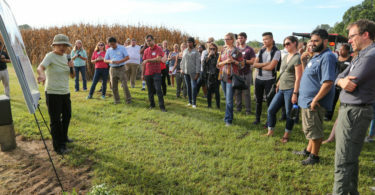 The NFT participants at Jaemor Farms. 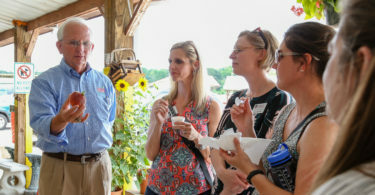 Georgia Agriculture Commissioner Gary Black greets NFT participants. 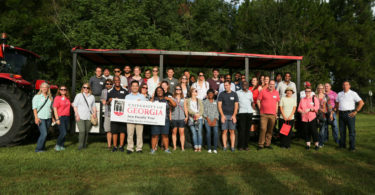 Georgia Agriculture Commissioner Gary Black with NFT participants. 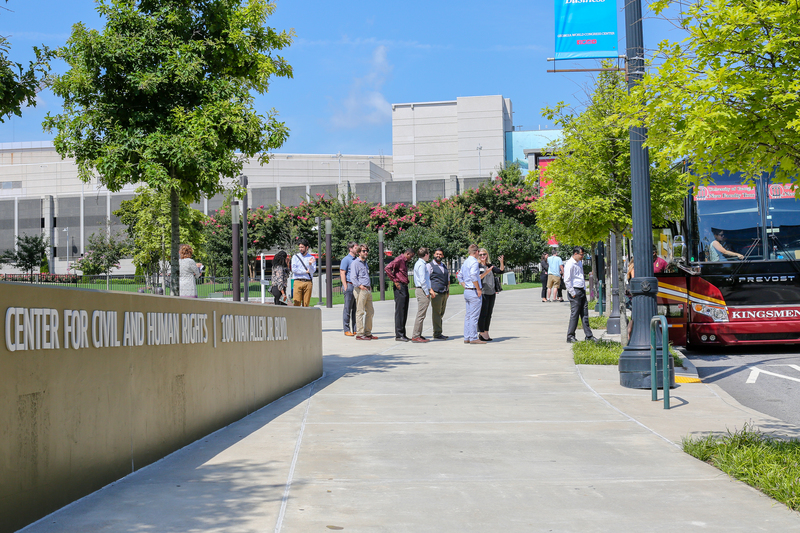 On the second day of the tour, the group visited the Center for Civil and Human Rights in Atlanta. 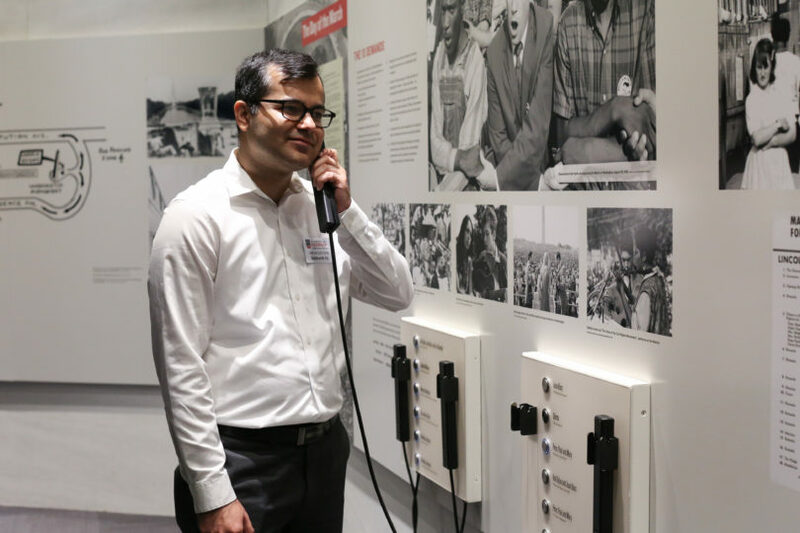 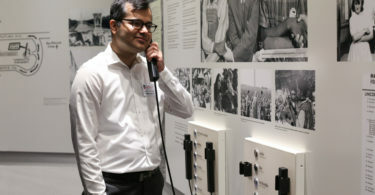 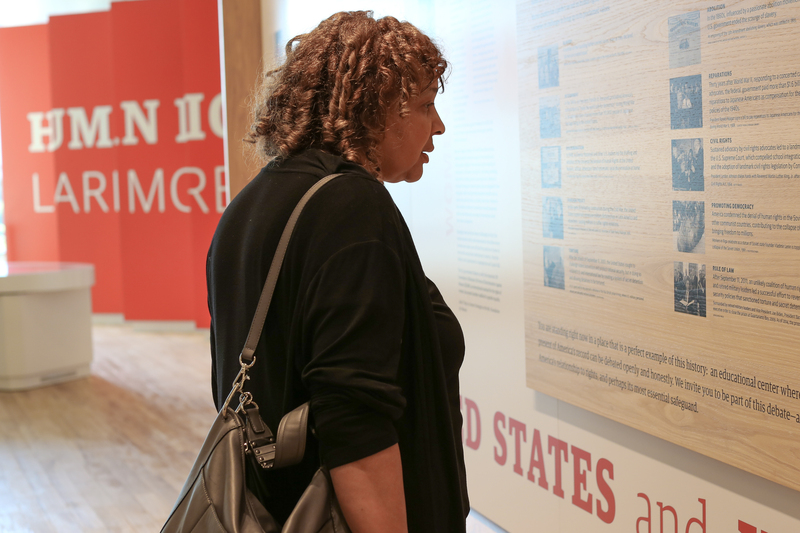 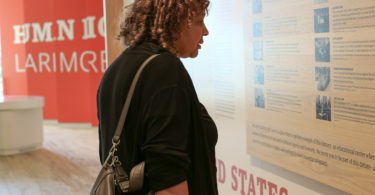 NFT participants had a chance to check out the displays at the Center for Civil and Human Rights in Atlanta. 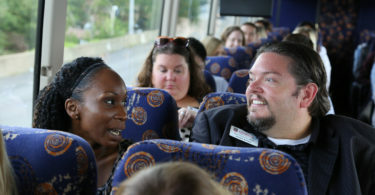 The NFT participants had a chance to meet and bond on the bus between stops. 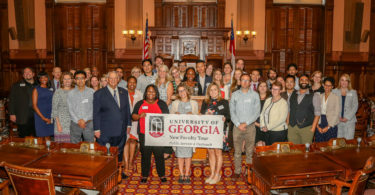 The NFT participants arrive at the Georgia state Capitol in Atlanta. 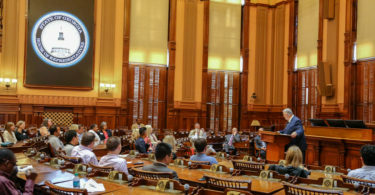 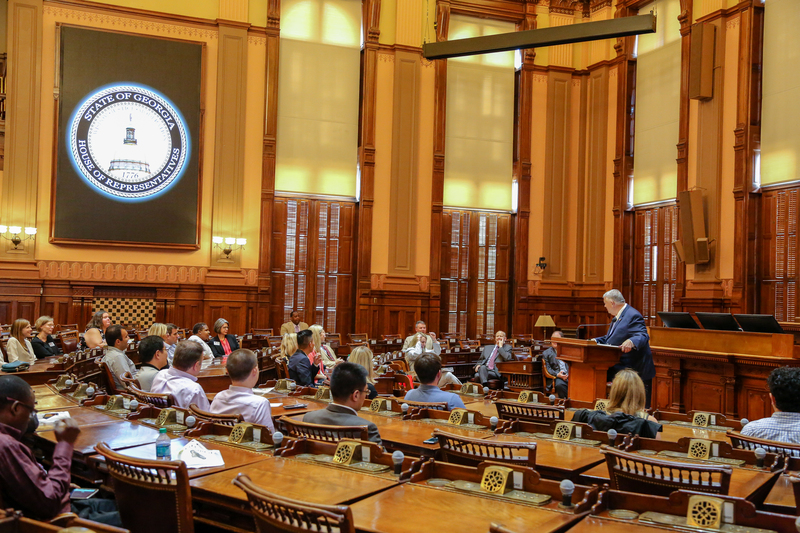 The NFT participants in the Georgia state Capitol in Atlanta. 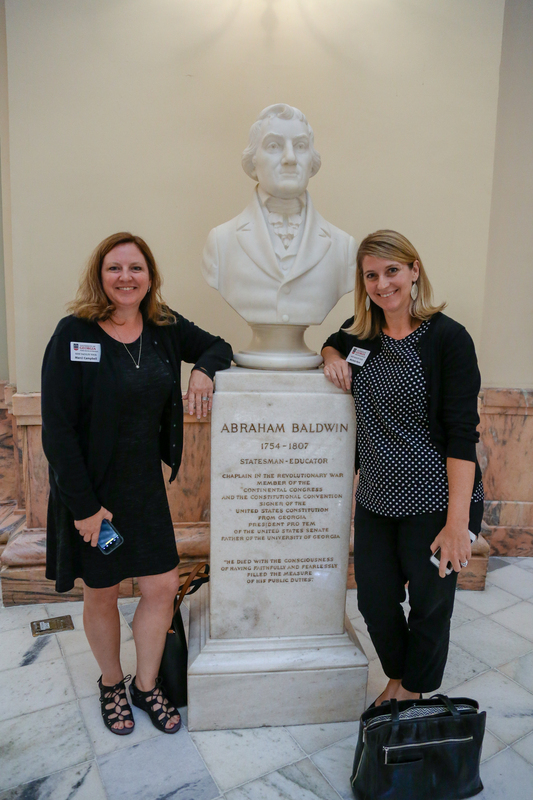 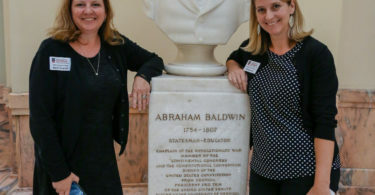 Marci Campbell with the Vinson Institute, left, and Michele Horn of Marketing & Communications check out a bust of UGA’s founder Abraham Baldwin in the Capitol. 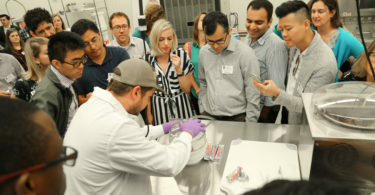 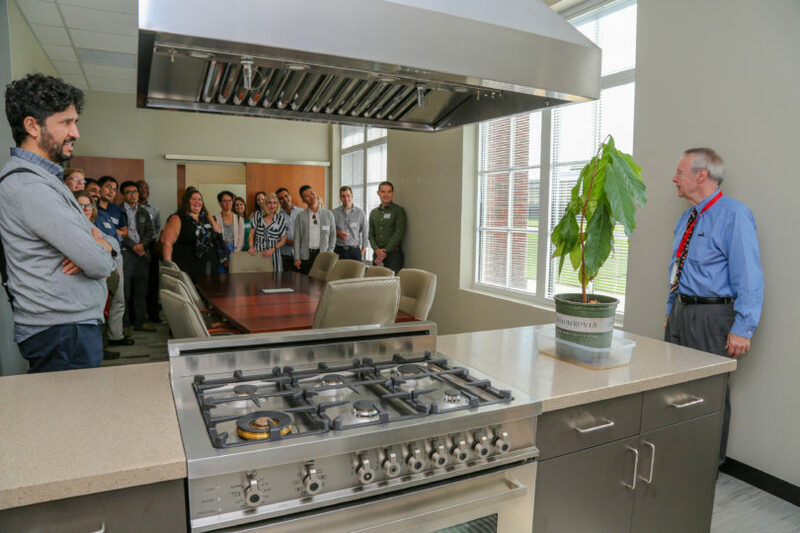 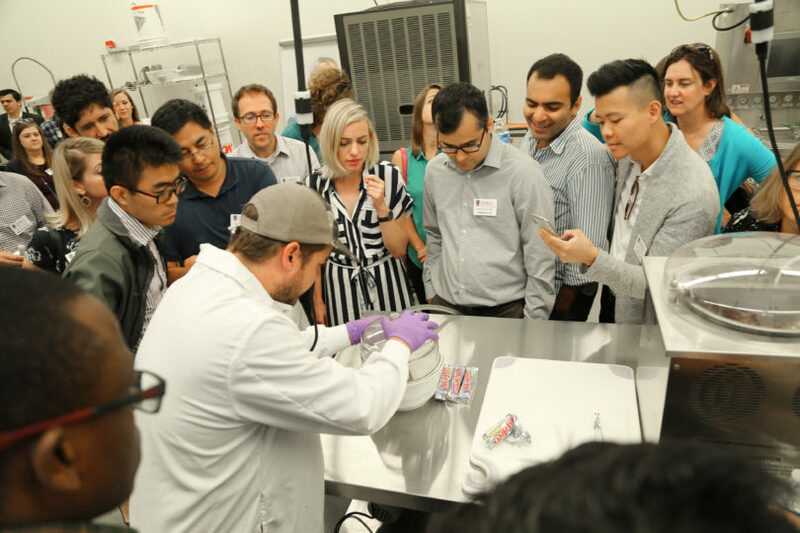 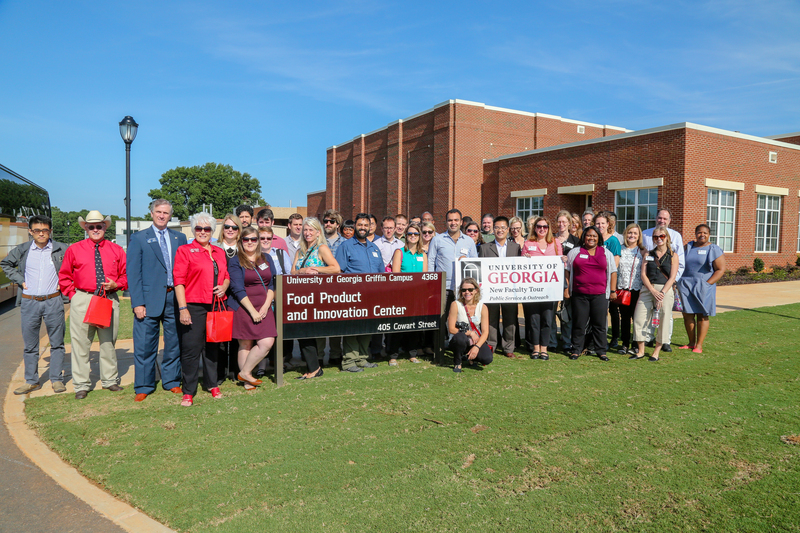 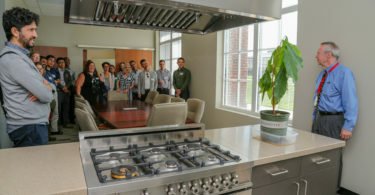 The NFT group took a tour of the Food Product Innovation and Commercialization Center, known as FoodPIC, on the UGA Griffin campus. 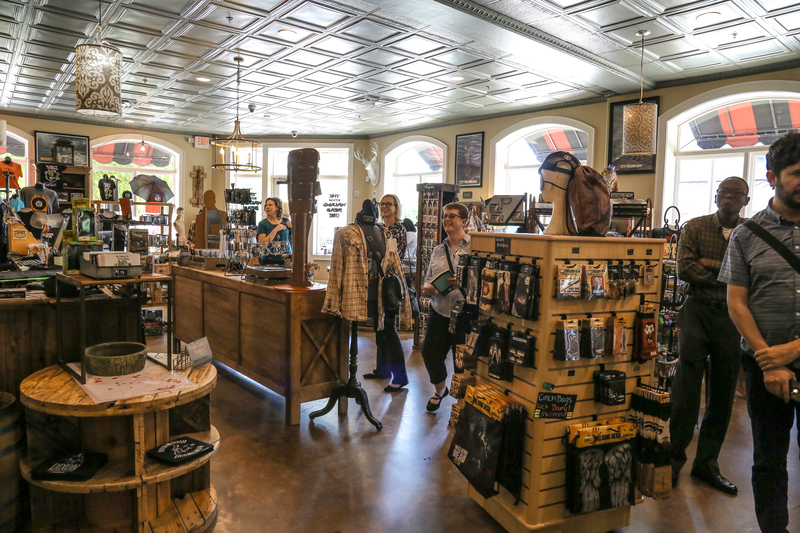 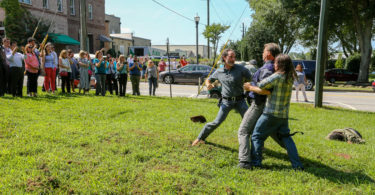 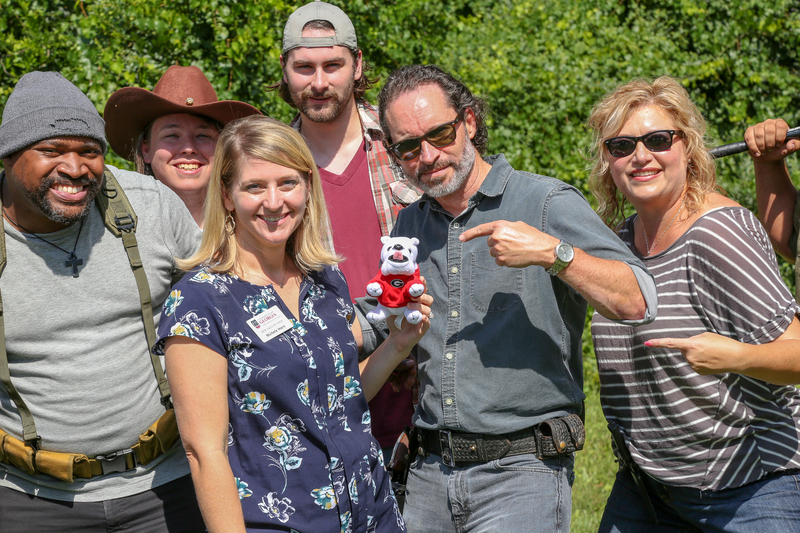 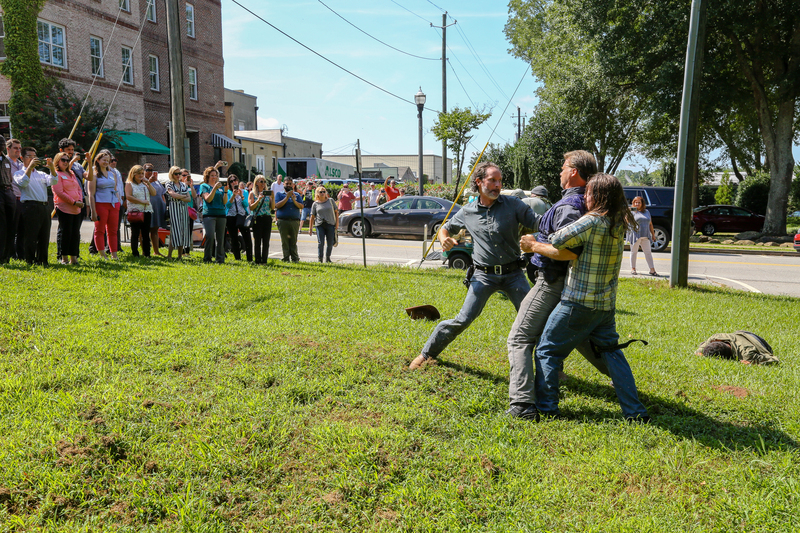 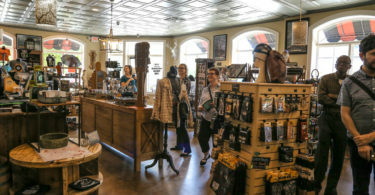 The NFT participants made a stop in Senoia, where “The Walking Dead” is filmed, as an example of the multi-billion-dollar film industry in Georgia. 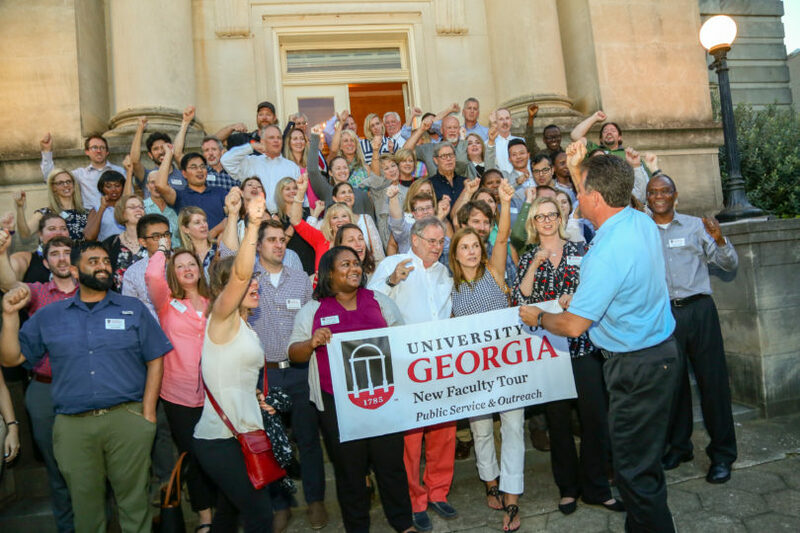 The NFT group “Calls the Dawgs” during a stop at the Carnegie Library in Americus. 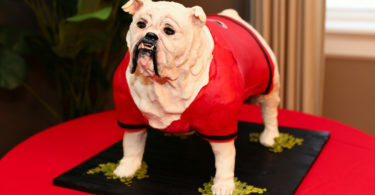 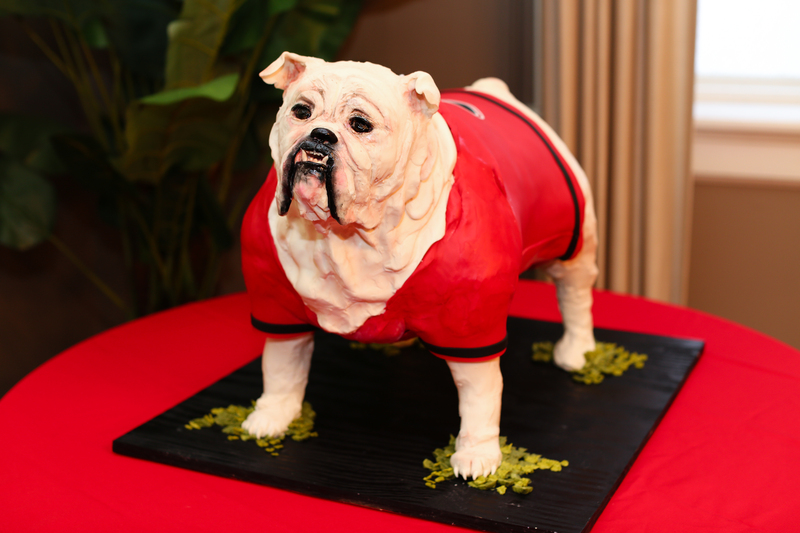 A cake of Uga awaited the group at the Carnegie Library in Americus. 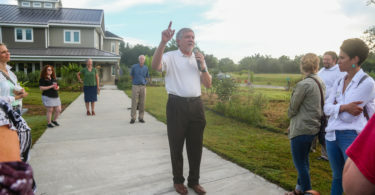 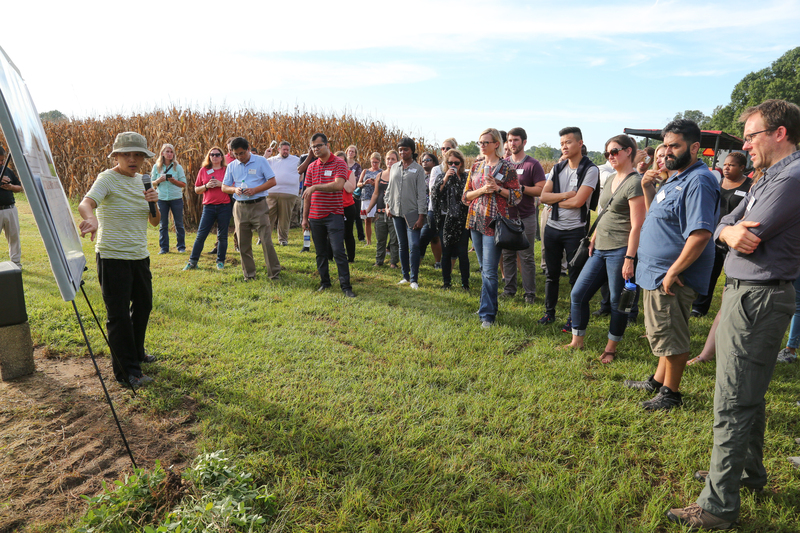 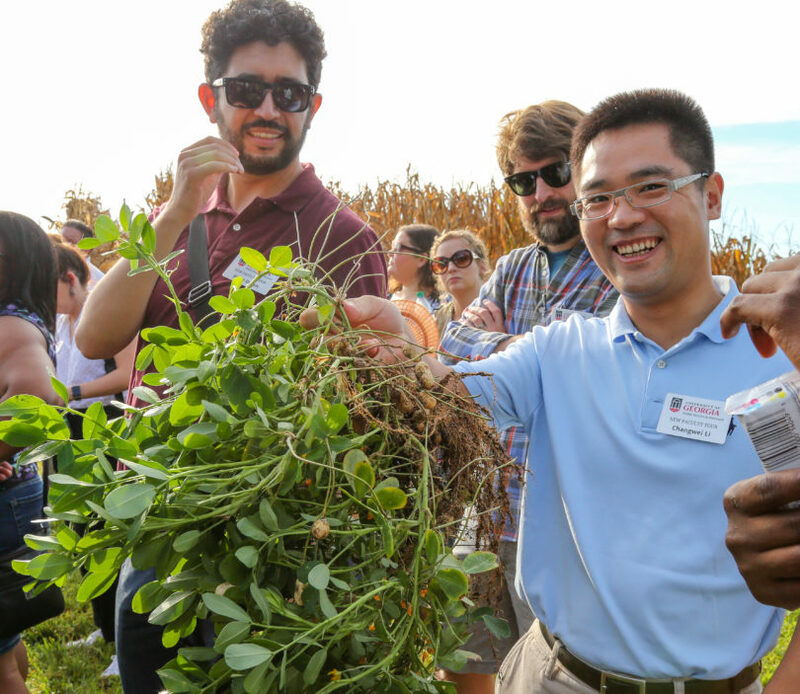 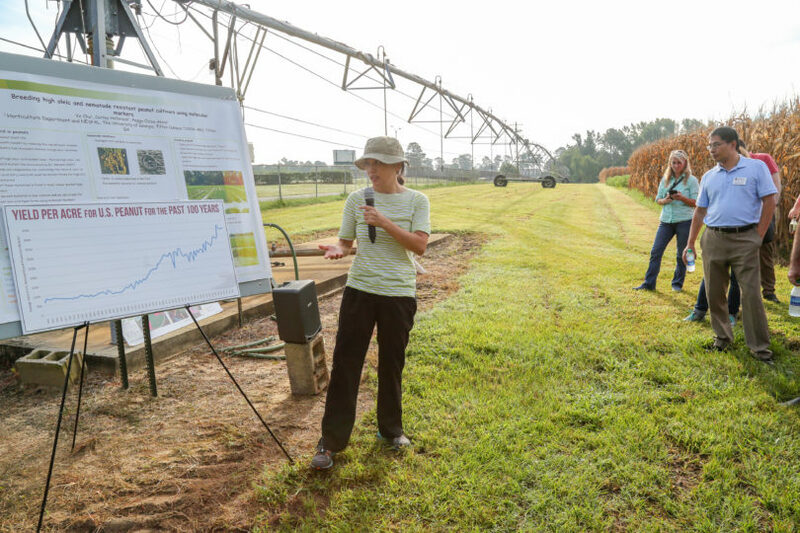 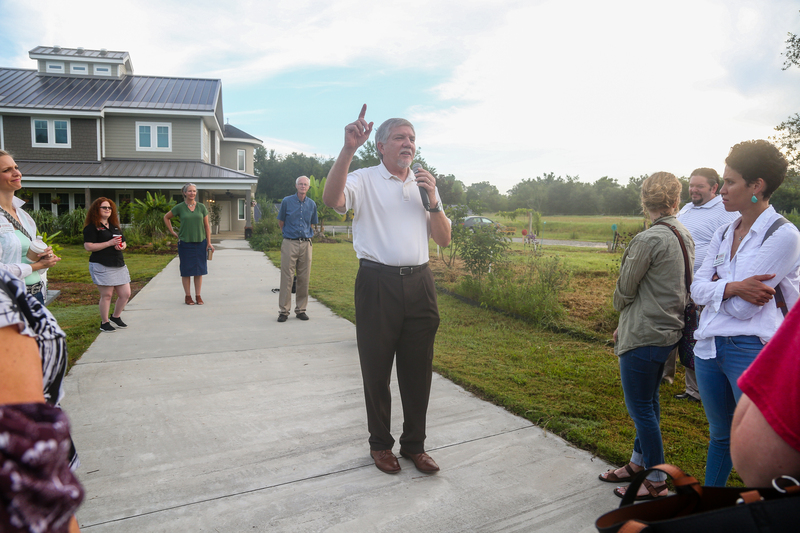 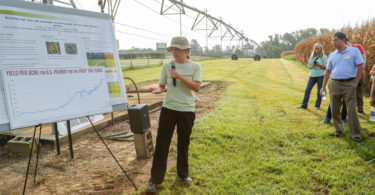 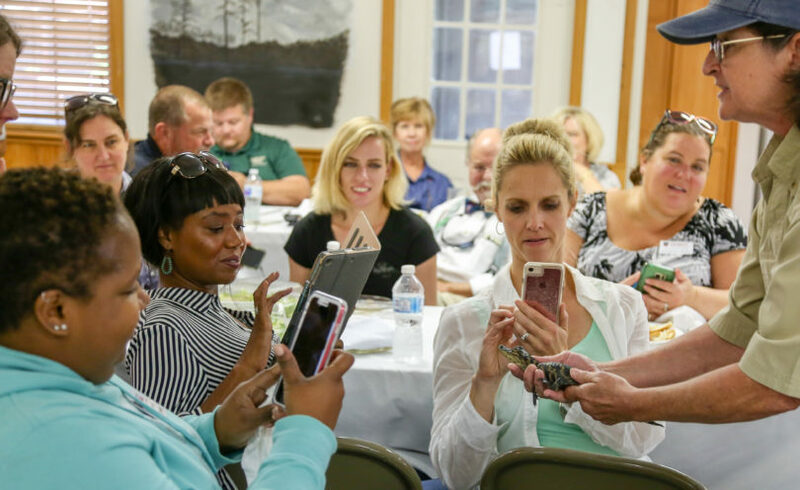 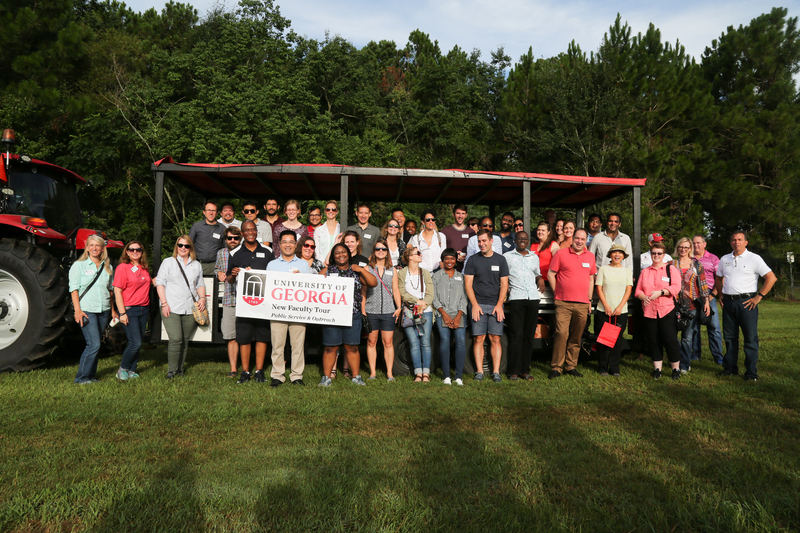 At UGA Tifton, the group visited the Future Farmstead, an energy independent experimental farm and farmstead dedicated to developing and demonstrating advanced technologies that will enhance farmer efficiency to achieve the nation’s future energy, food, and environmental requirements. 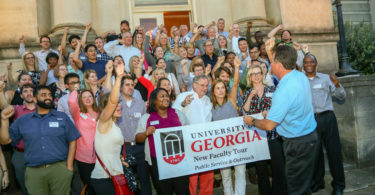 The group gets a tour of the UGA Tifton campus. 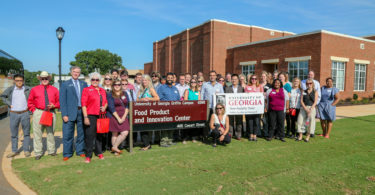 The group learns about the cutting edge work being done at UGA Tifton to improve agricultural practices across the state. 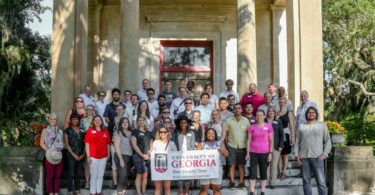 NFT participants pose for a group shot on the UGA Tifton campus. 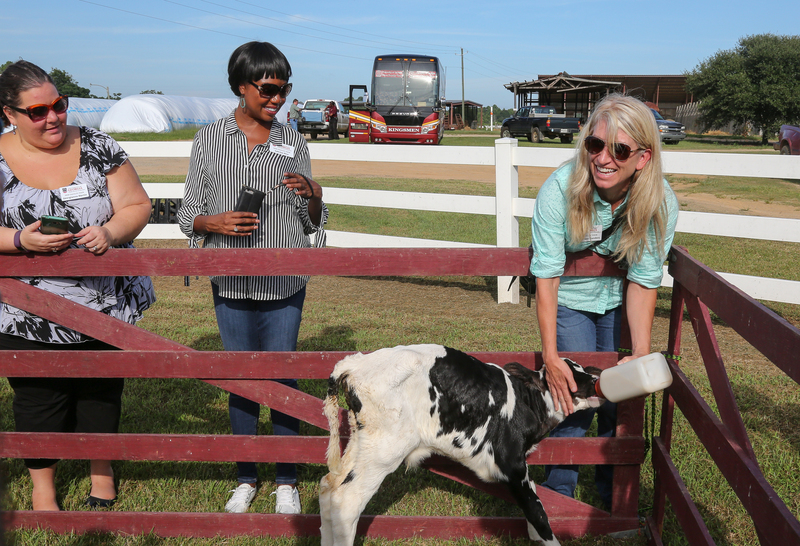 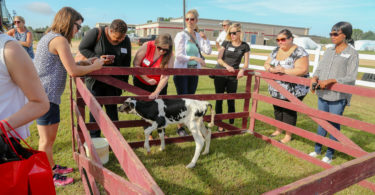 New Faculty Tour participants had a chance to feed calves while visiting the UGA Tifton campus. 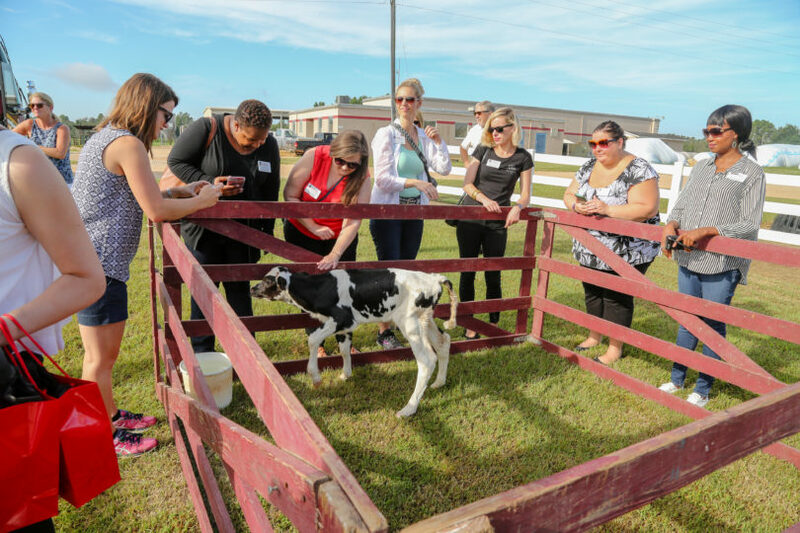 NFT participants had a chance to feed calves while visiting the UGA Tifton campus. 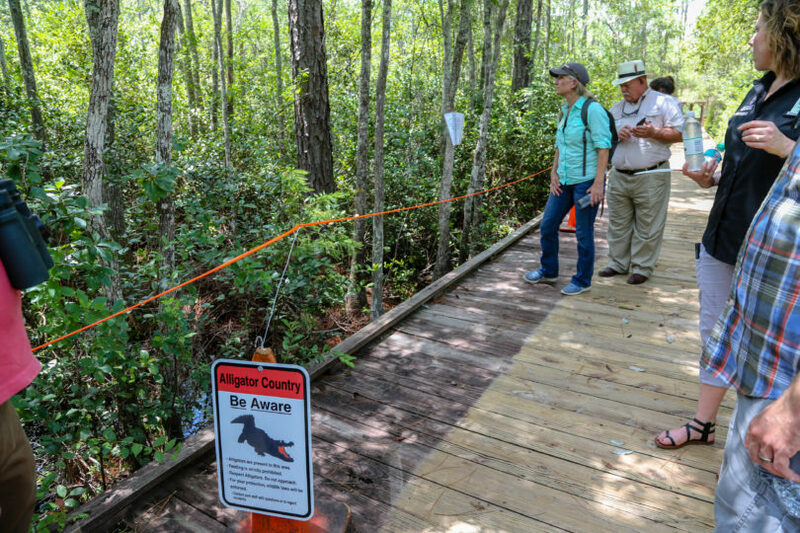 The NFT stopped at Okefenokee Swamp Park to learn about this unique habitat and the animals and plants that live there. 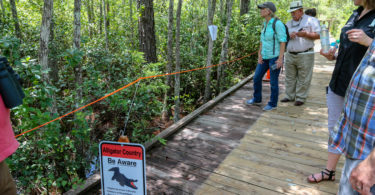 UGA is partnering to do research on the alligator population. 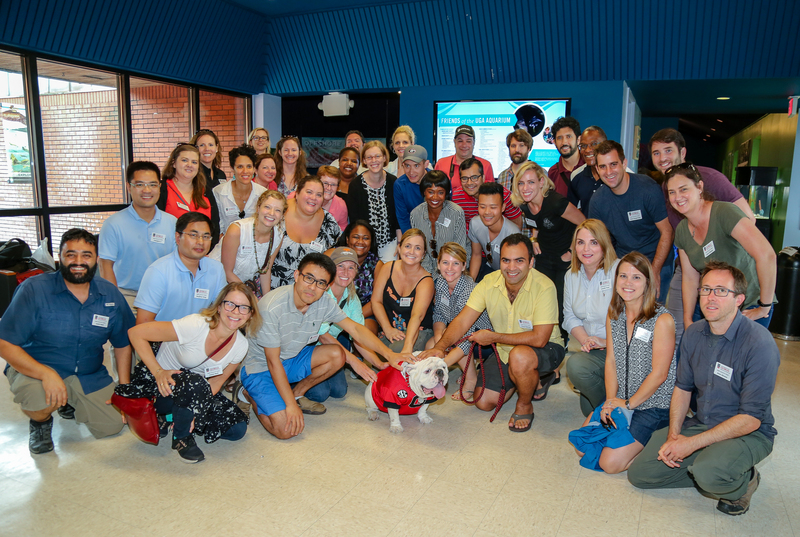 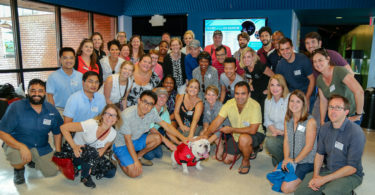 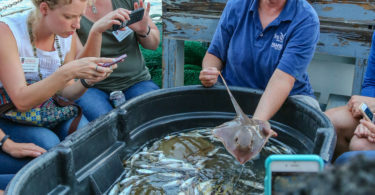 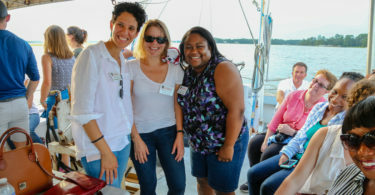 The NFT participants got a chance to pose with Uga X during a stop at UGA Marine Extension and Georgia Sea Grant on Skidaway Island. 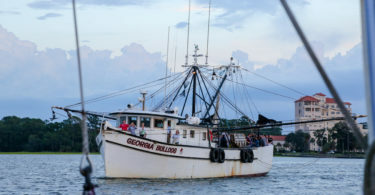 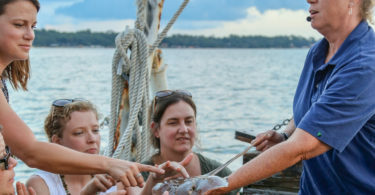 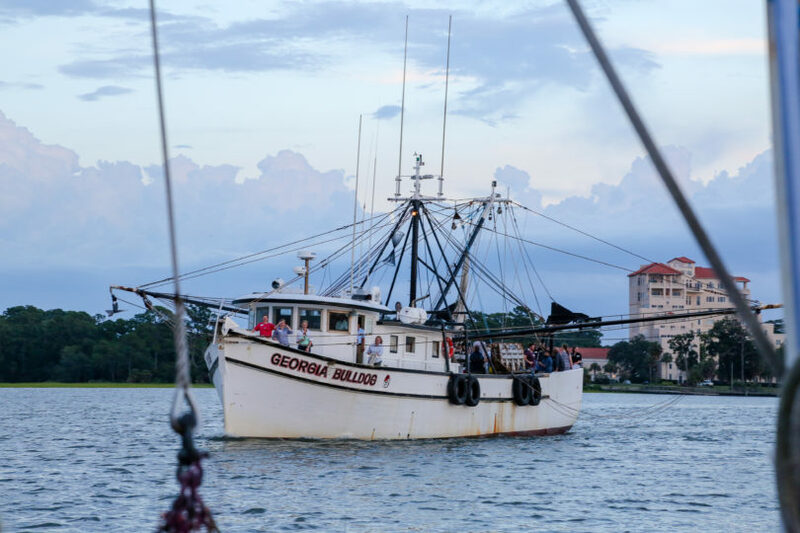 The group got out on the water during a stop at UGA Marine Extension and Georgia Sea Grant on Skidaway Island. 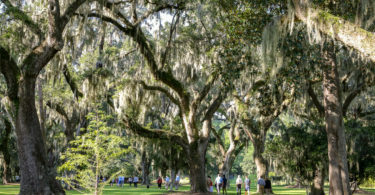 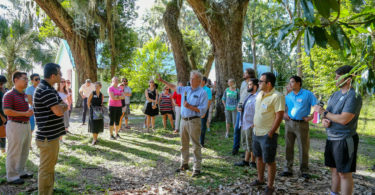 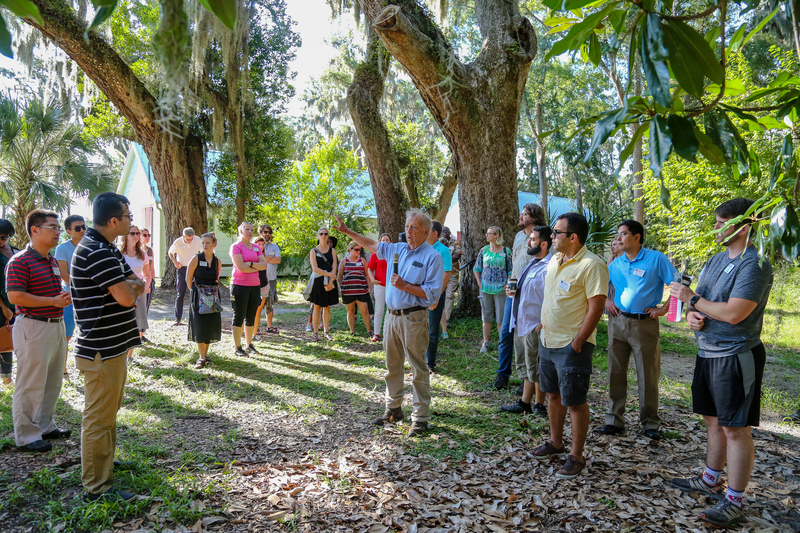 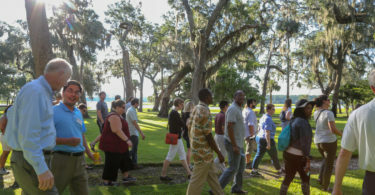 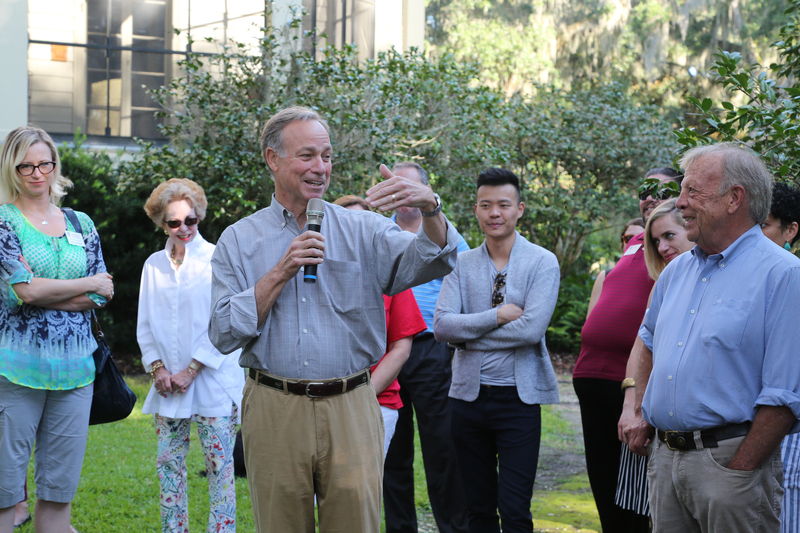 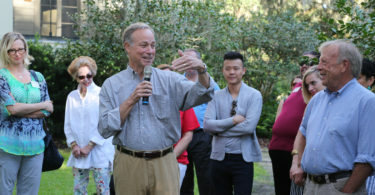 The group was introduced to the work being done at the Wormsloe Institute for Environmental History in Savannah, one of Georgia’s oldest tidewater estates. 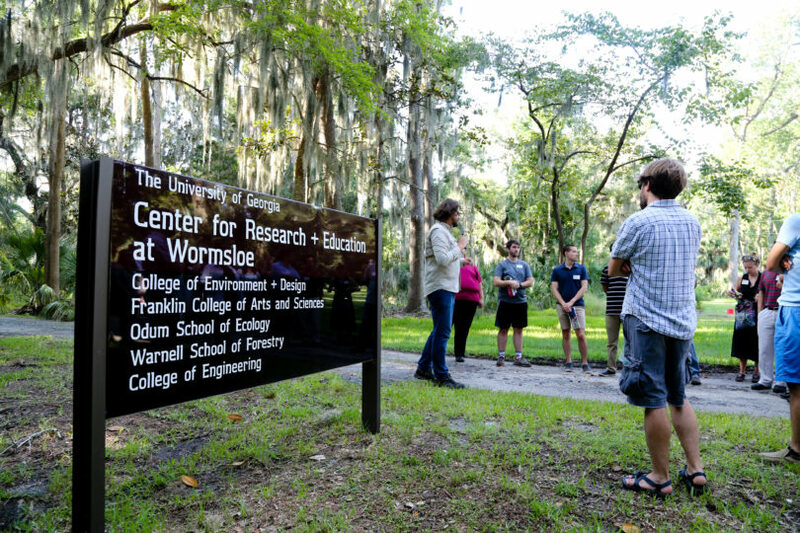 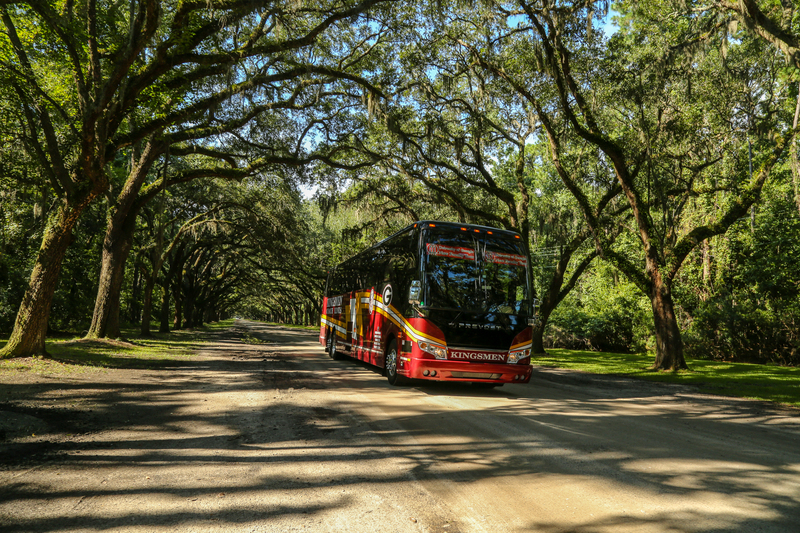 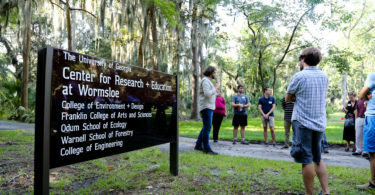 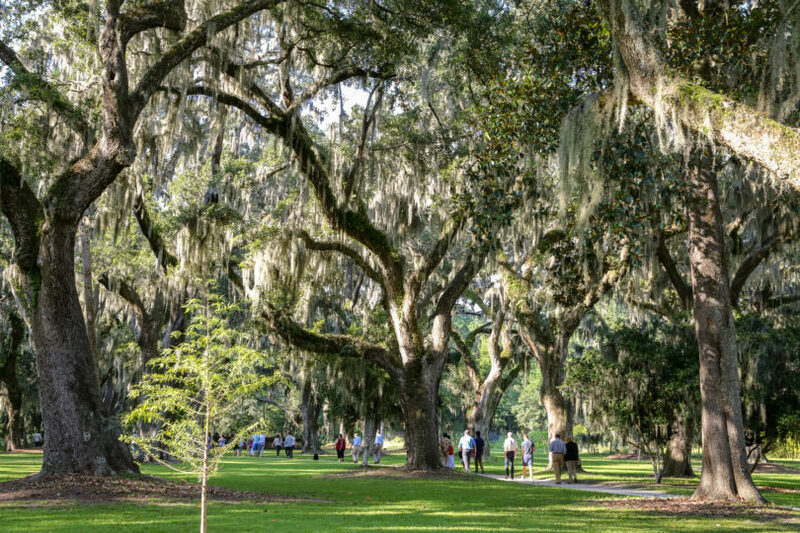 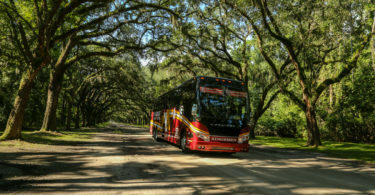 Several UGA colleges and units are conducting research at Wormsloe. 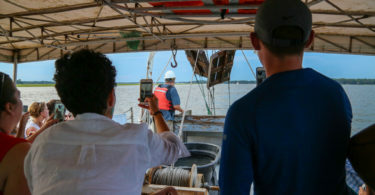 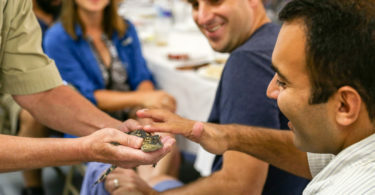 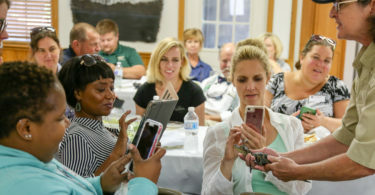 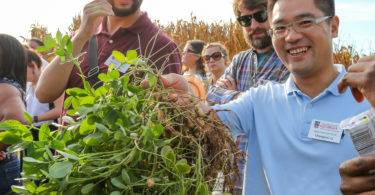 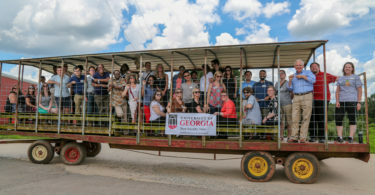 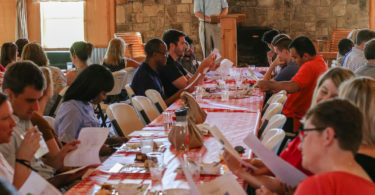 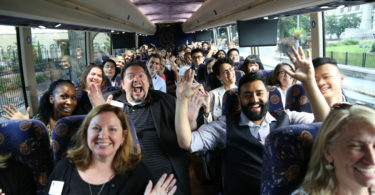 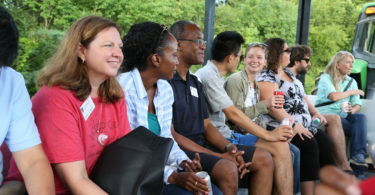 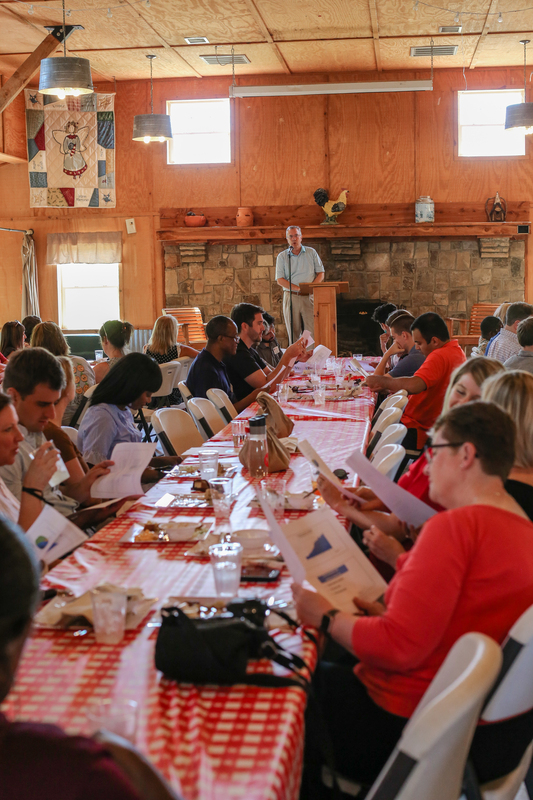 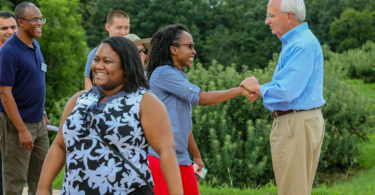 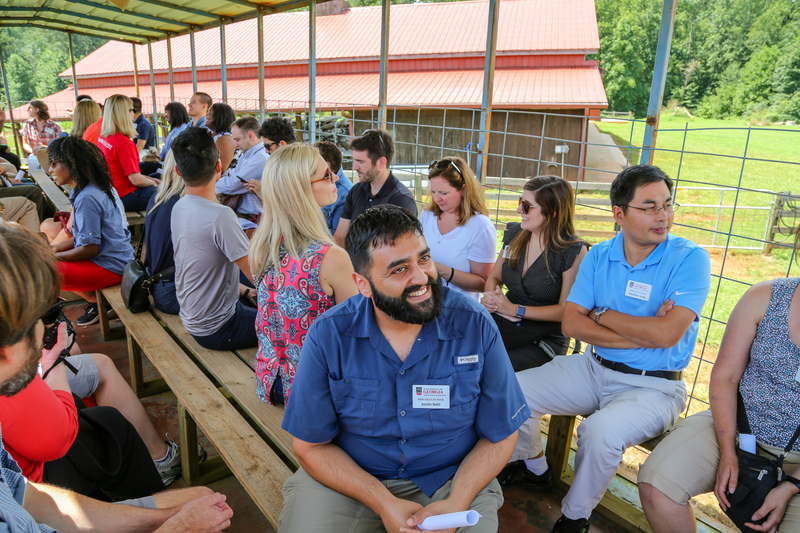 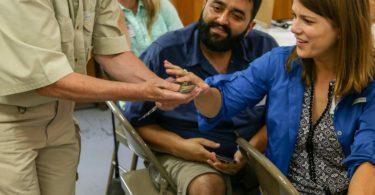 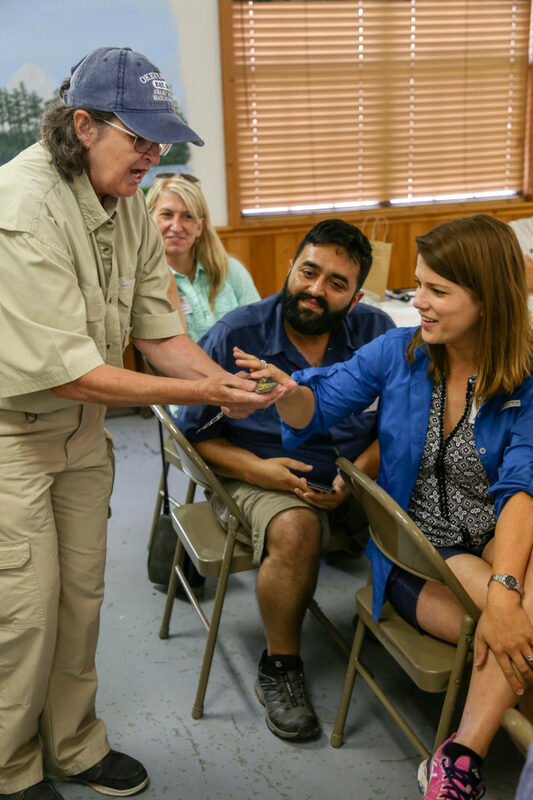 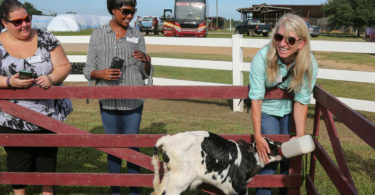 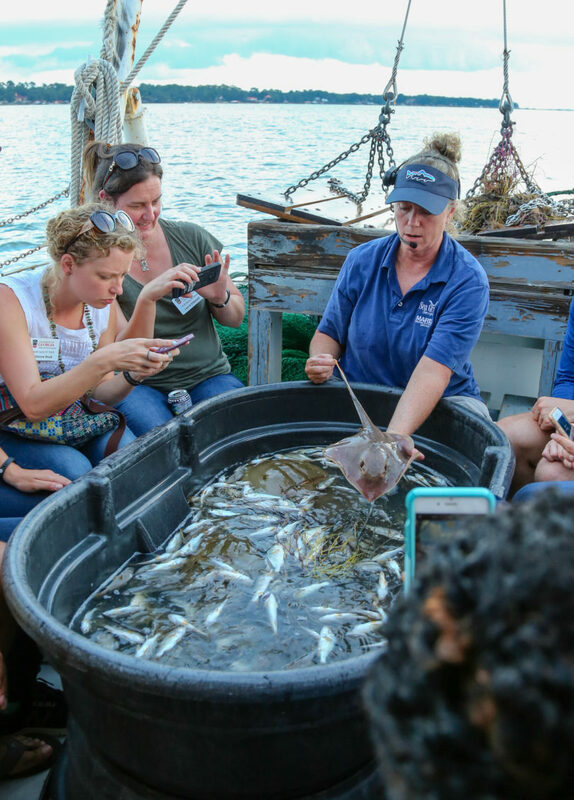 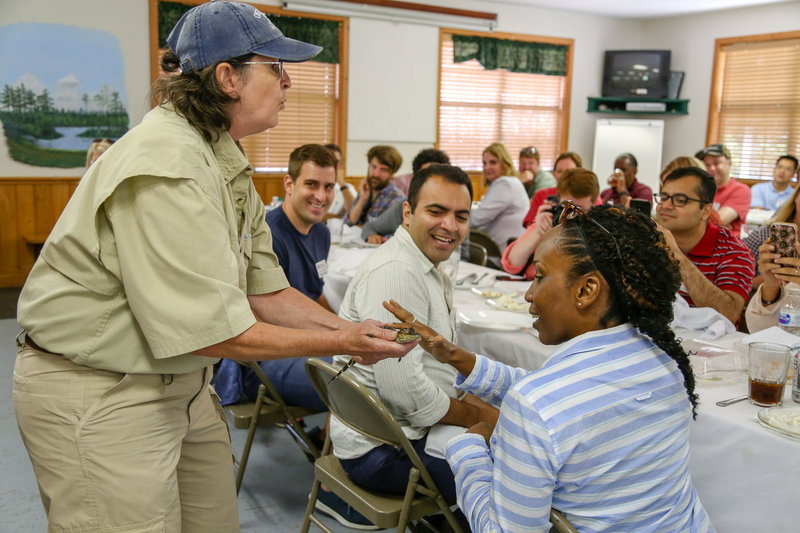 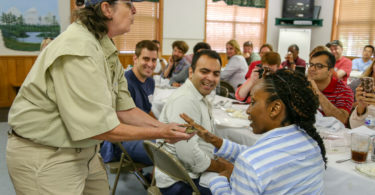 About 40 new University­­­­ of Georgia faculty members took a five-day tour of the state that showcased agriculture and agritourism, industry, innovation, the Georgia coast and its rural communities. 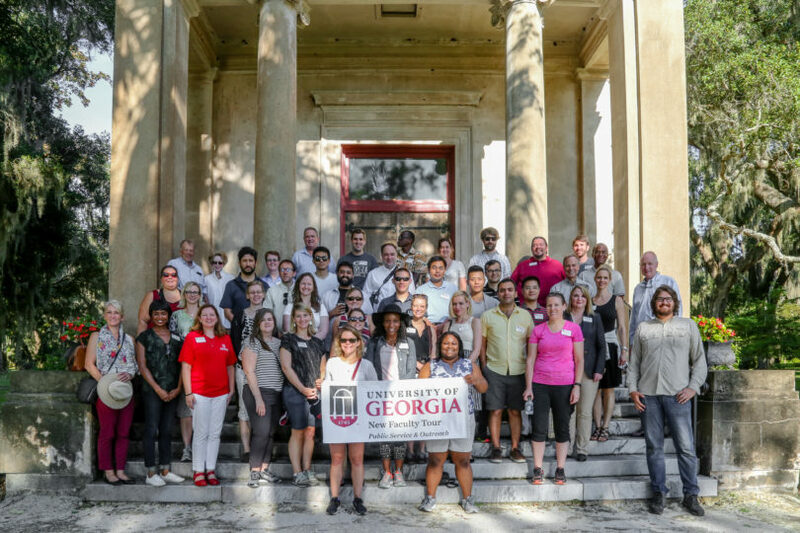 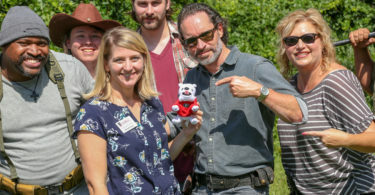 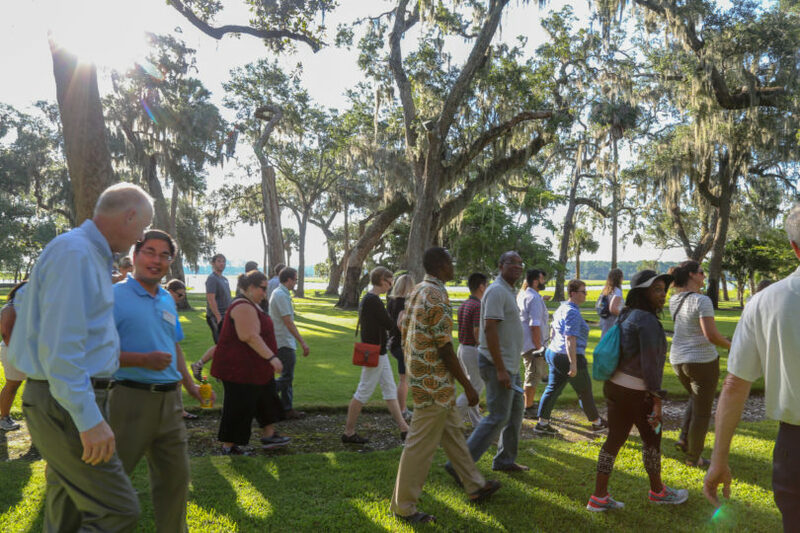 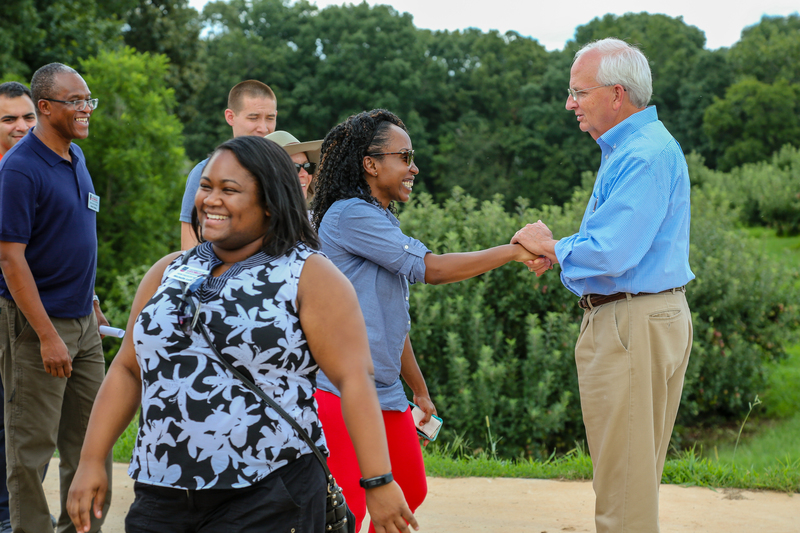 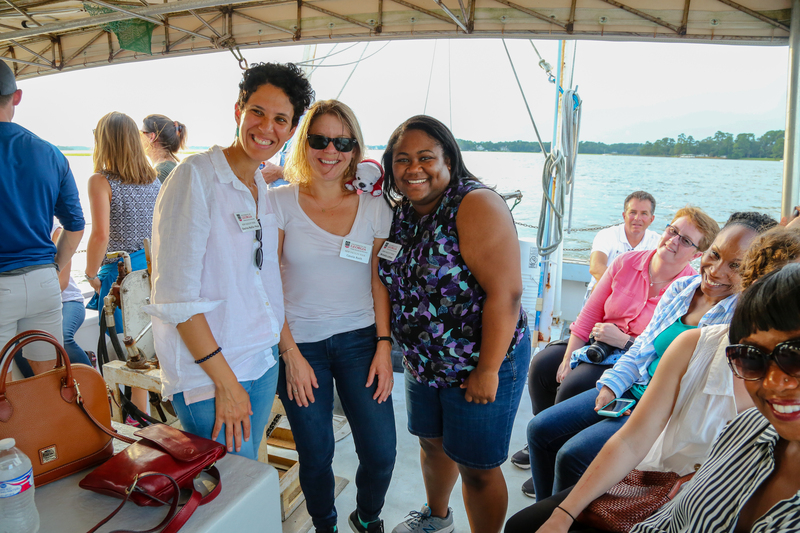 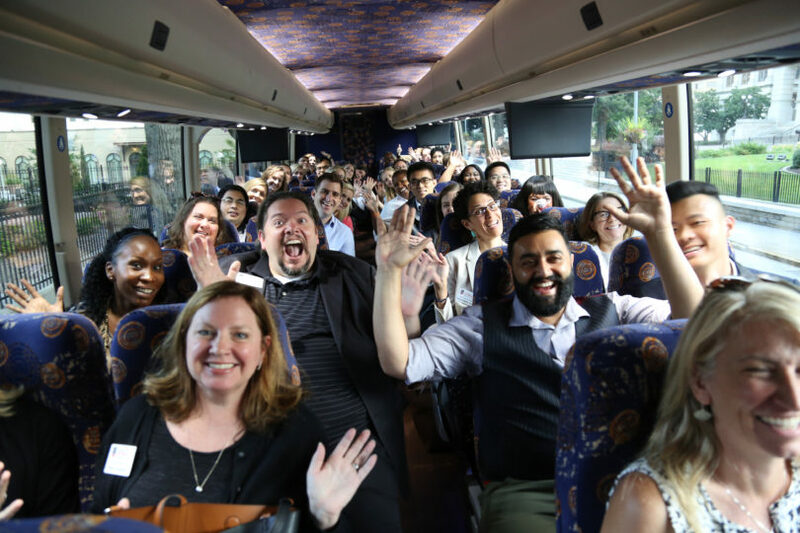 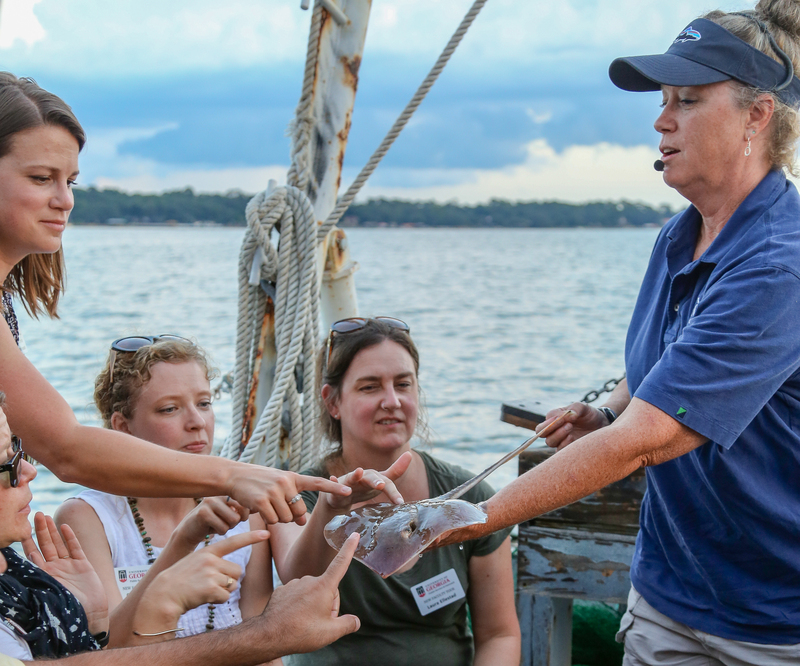 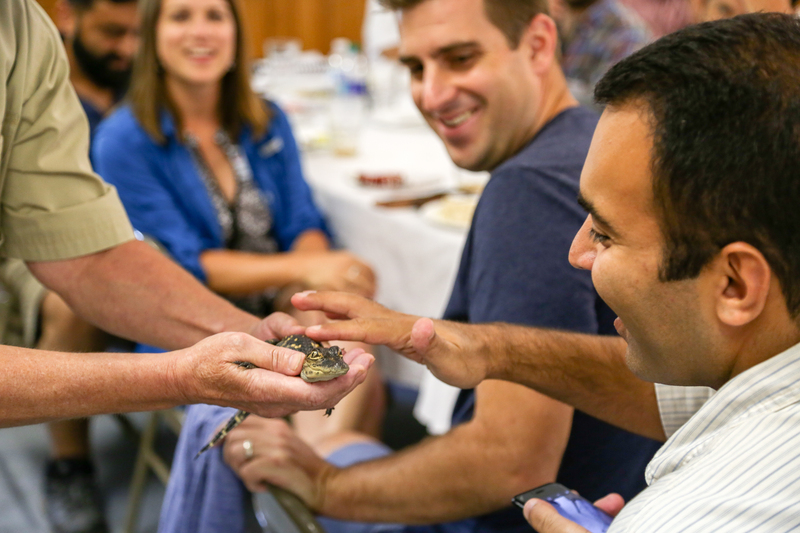 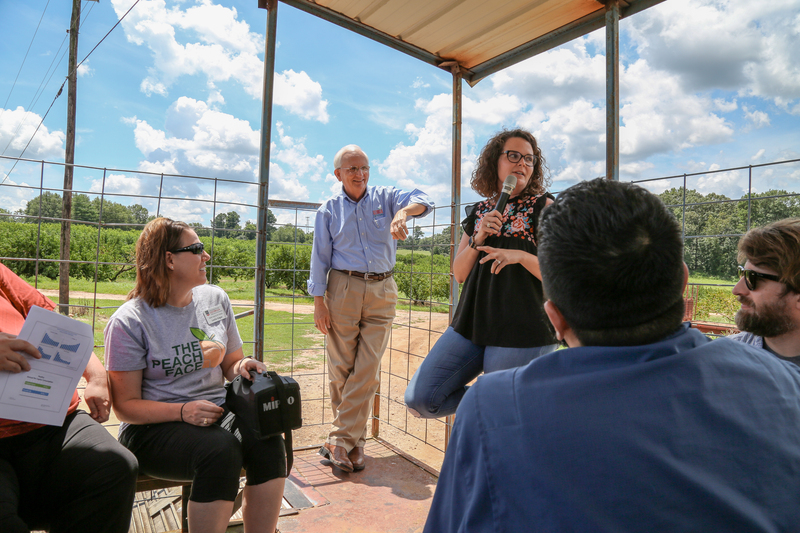 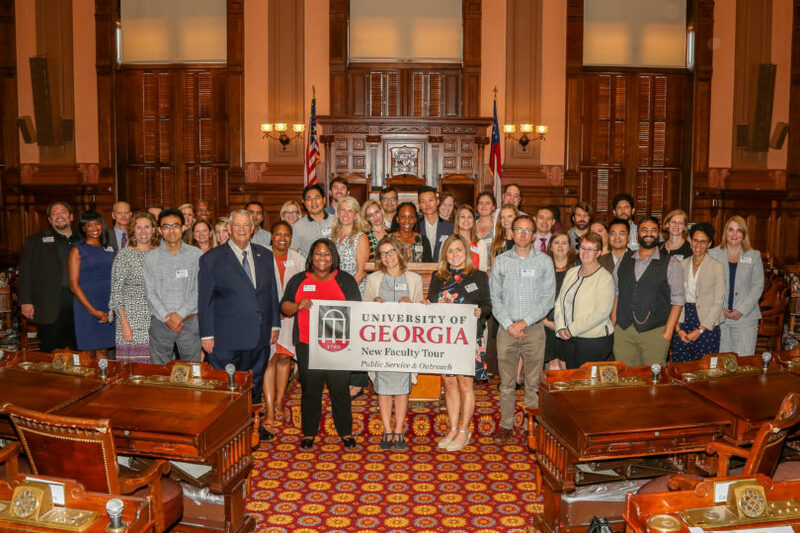 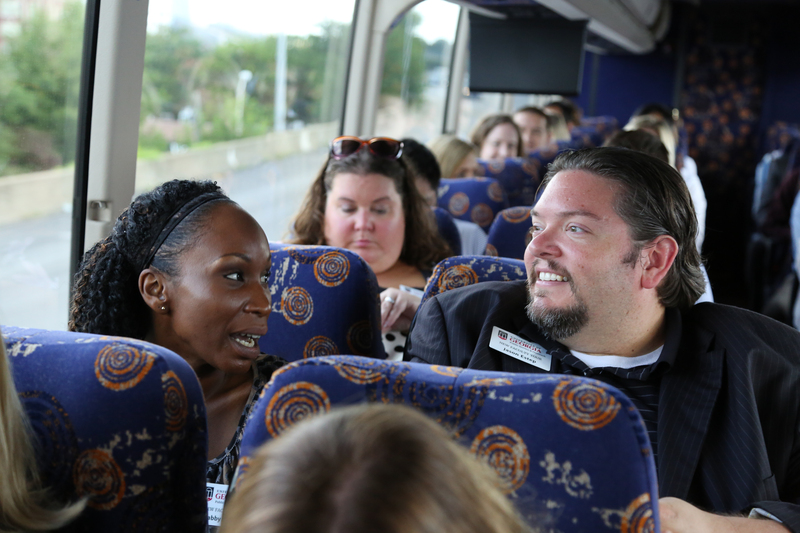 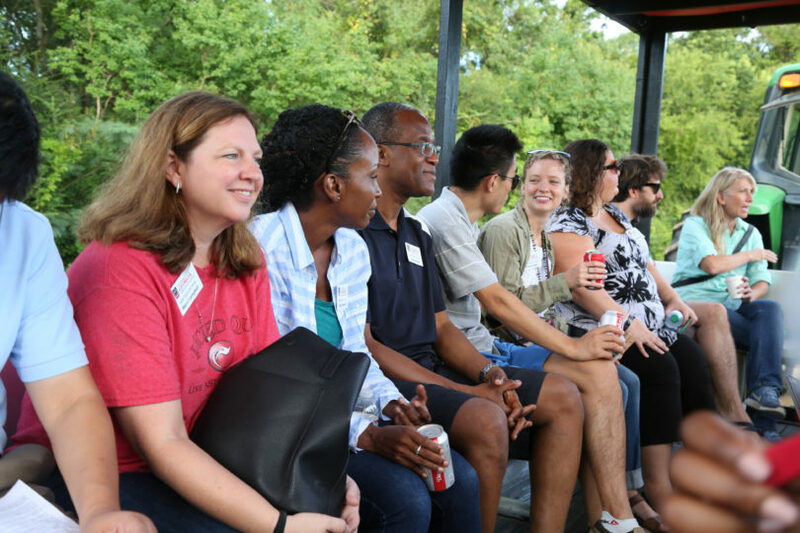 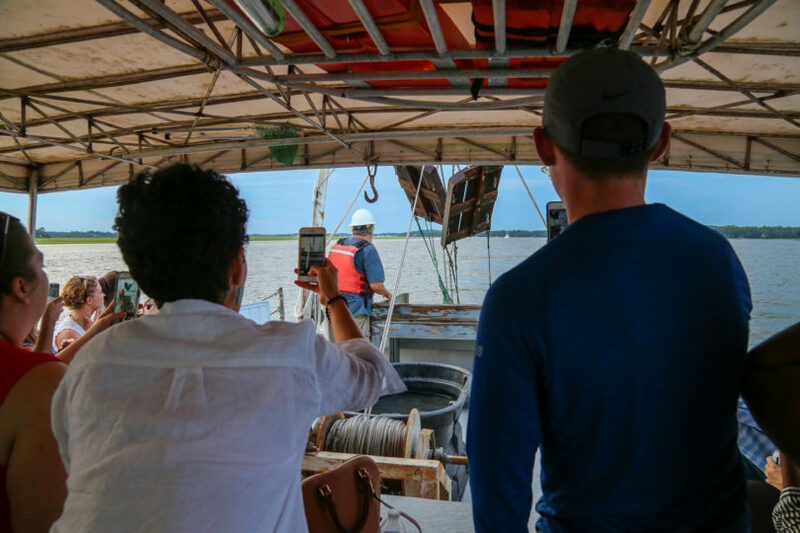 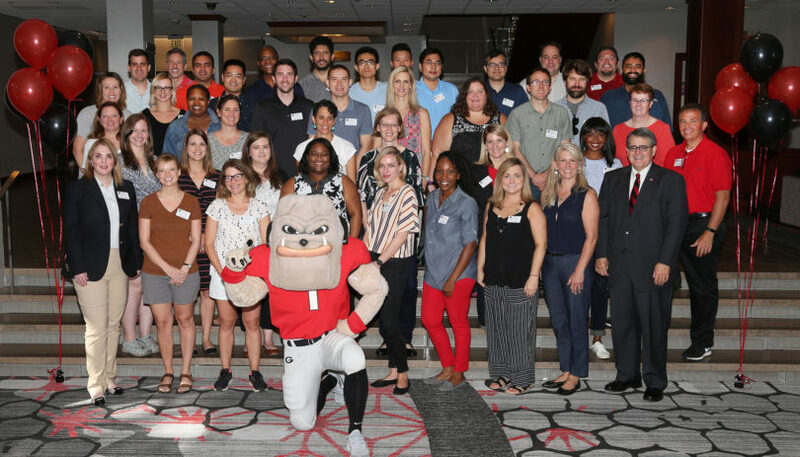 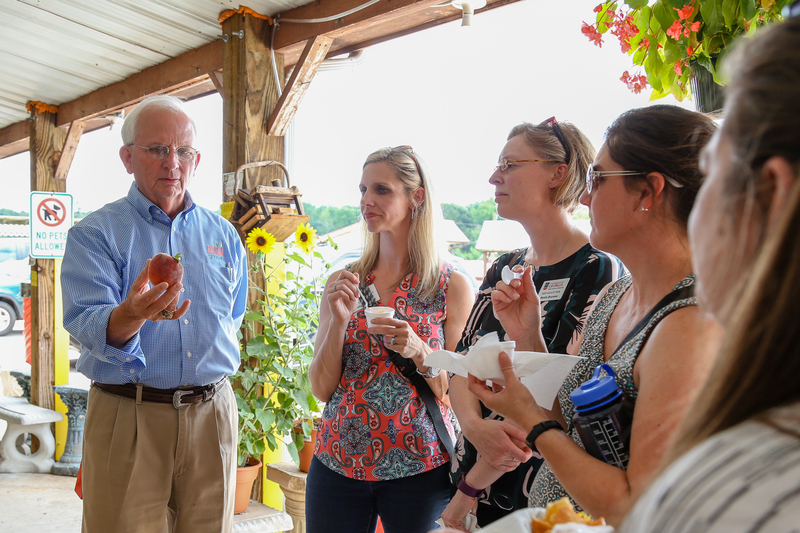 From Aug. 6-10, the New Faculty Tour visited 15 cities and passed through 48 counties, introducing faculty who have been at UGA for two or fewer years to the geography, culture, history and economic engines of the state. 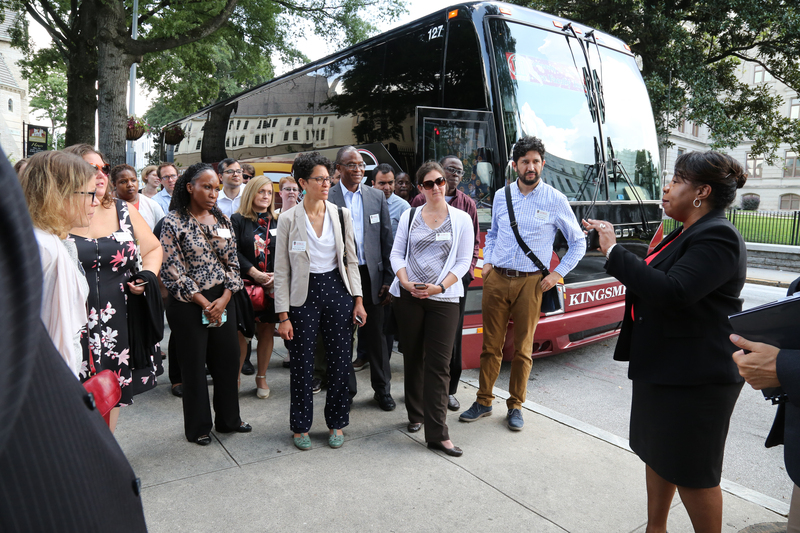 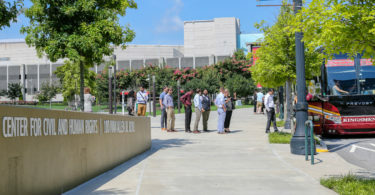 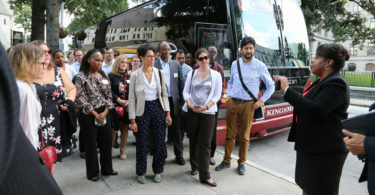 The New Faculty Tour is coordinated by the Office of the Vice President for Public Service and Outreach and is made possible by major support from the Office of the President, the Office of the Provost, and the Office of the Vice President for Public Service and Outreach. 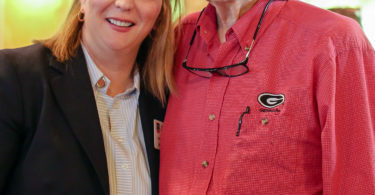 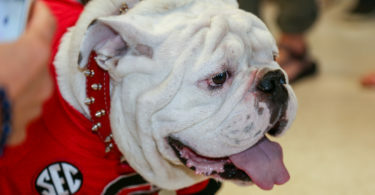 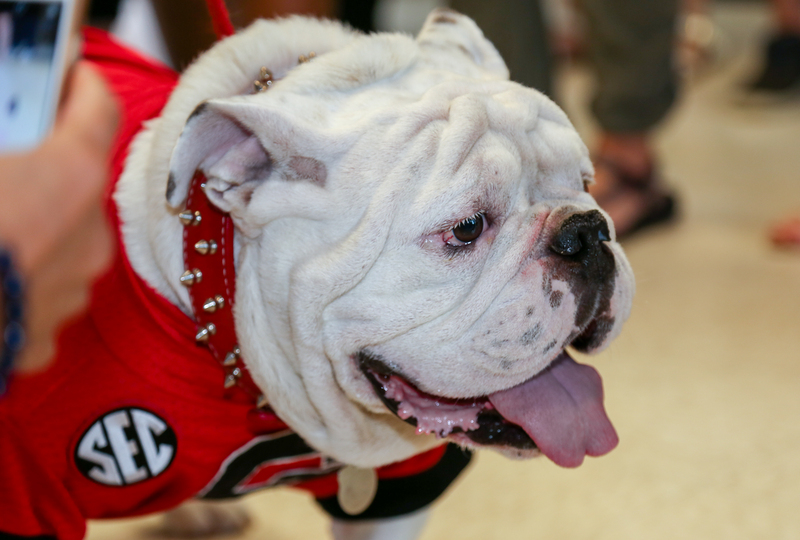 Additional sponsors include the UGA Alumni Association, UGA Foundation, and a multitude of other units and supporters of the University of Georgia.